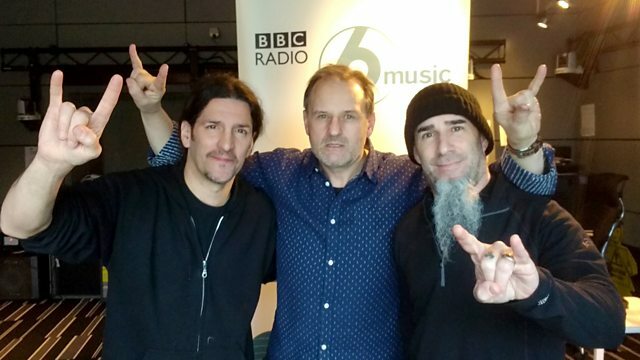 Mark Radcliffe presents solo and is joined by heavy metallers Anthrax for some romantic headbanging thrashment. Mark Radcliffe presents on his own today but fear not! He will not be a lonely heart this Valentine's Day for his guests are heavy metallers Anthrax, who will no doubt thrash out the perfect romantic soundtrack in a traditional metal stylee. From New York City, they first got together in formed in 1981 by guitarist Scott Ian and bassist Dan Lilker. Anthrax is considered one of the leaders of the thrash metal scene and out the "Big Four" (the others being Metallica, Megadeth and Slayer, Anthrax were the only band from the East Coast. As of 2016, the band has released 11 studio albums, several other albums, and 26 singles, including collaborating on a single with American hip hop group Public Enemy. PLUS why not stoke the fires of The Chain with another song to add to the 6000-plus already on there. Or gather the office around the wireless for a round of Tea Time Theme Time, when you must guess the link between the three records...AND get your name read out on the wireless! What better early treat for the New Year could there ever be (rhetorical question)? Wreck A Pum Pum ‎.